BRICS Bank: The New Multipolar De Facto World Bank ? It was born as the BRICS Development Bank for construction projects extending from the alliance of Brazil, Russia, India, China, and South Africa. It later changed to the BRICS Bank. 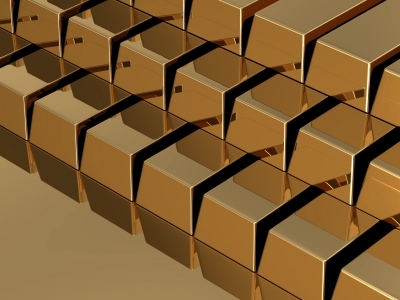 It will eventually become known as the Gold Trade Central Bank, the main processing center for supplied USTreasury Bonds accumulated by the emerging nations, converted to Gold bullion. At this point, the BRICS Bank is gathering in funds, typically in USTBond form. The details will be revealed in time, but this bullion bank will become a behemoth, and the core to global trade stability. The member nations will direct their FOREX reserves, largely USTBonds, into the BRICS Bank. The ruse is that infrastructure projects is cited in order to divert attention from US & UK attacks. 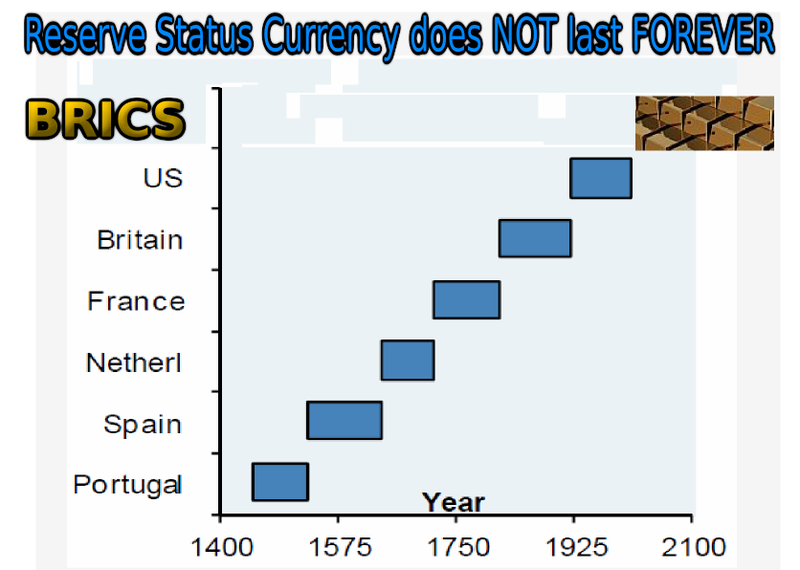 The conversion of USTBonds for Gold bullion will make for a historically significant event in the Paradigm Shift for commerce and eventually banking, in brutal fashion, as USTBonds are redeemed (liquidated) for Gold. At the Sixth Summit of BRICS (Brazil, Russia, India, China and South Africa) to be held July 14, 15 and 16 in Brazil, a new financial architecture is scheduled to be established. A monetary stabilization fund called Contingent Reserve Arrangement (CRA) and a development bank called BRICS Bank will begin to operate after the summit de facto in opposition to the IMF and World Bank. The CRA will have 100 billion, with contributions from China of 41 billion dollars; Brazil, India and Russia, with 18 billion each and South Africa with 5 billion. The BRICS Development Bank will begin operation with a capital of 50 billion dollars with contributions of 10 billion and guarantees of 40 billion from each of its members and will be able to expand to 100 billion dollars within two years, and to 200 billion in five years; it will have a capacity of financing up to 350 billion. Expect each BRICS nation to have a central bank processing plant to convert the toxic USTBonds into Gold bullion. They will process the other sovereign bonds as well. Expect Shanghai and Hong Kong to have one, and Moscow, along with Delhi India and Rio de Janeiro Brazil, Johannesburg South Africa too. Other nations will host BRICS central bank satellites like Riyadh in Saudi Arabia and Dubai in the United Arab Emirates. Eventually expect BRICS central banks to spring up in Frankfurt Germany, in Ankara Turkey, in Tokyo Japan, and in Tehran Iran. It will be impossible to stop the trend in diversification out of USTBonds and into Gold since it is healthy and part of a bonafide solution. To be sure, a large amount will be converted into Chinese Yuan and Russian Ruble, since much Eastern trade will be settled in those two rising currencies. They will both give birth to gold-backed currencies. Ironically, both China & Russia are in possession of far more Gold reserves than the global economy sees in currency flow for their Yuan and Ruble currencies. The energy trade will soon be settled in Yuan and Rubles, in response to the stupid USGovt sanctions that have all the appearance of self-inflicted shotgun wounds to the face and chest, even onions. This entry was posted in Finance and Economics, World News and tagged bank, BRICS, currencies, De Facto, gold trade, gold-backed, reserve, Sixth Summit by cnlib. Bookmark the permalink.